The largest of the three turbinate bones, the inferior conchae or inferior turbinates are a pair of identical bones, covered in a thick mucus layer, located below the superior and middle conchae [1, 2]. 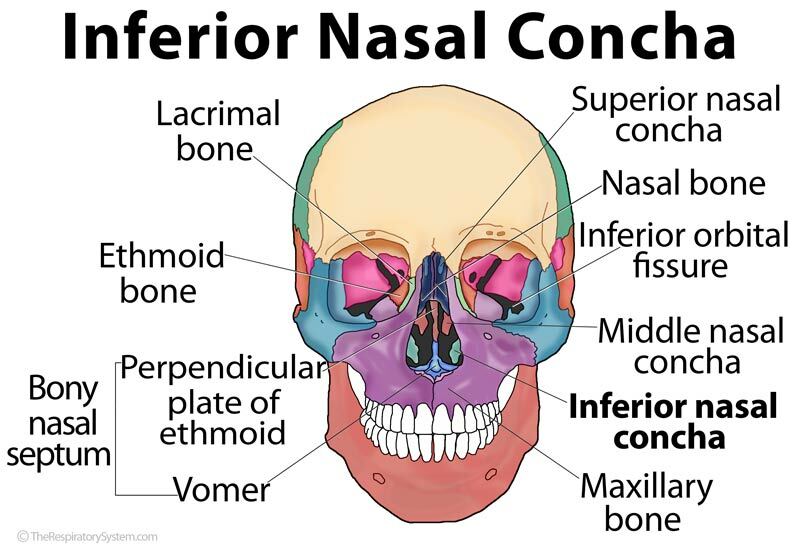 Unlike the other two bones, the inferior concha is considered a bony structure by itself, sitting on the nasal septum, separating the two nasal cavities . The flat, spongy bone has a curled up appearance, resembling a scroll . It has a convex medial surface having multiple longitudinal grooves that enable blood vessels to transport to the mucus layer covering the bone . The middle portion has three well-defined processes, varying in size and shape; the small pointed lacrimal or anterior process articulates with the lacrimal bone by its top side, while its margins articulate with the maxilla. This articulation helps in the formation of the nasolacrimal canal. 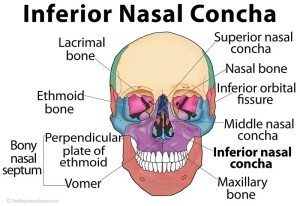 The thin, broad ethmoidal process situated behind the lacrimal process joins with the ethmoid bone. Another thin lamina called the maxillary process extends downward to articulate with the maxilla, partially forming the maxillary sinus’s medial wall . Ossification of the turbinate bone occurs from the single center that appears in the fifth month of fetal growth in the cartilaginous lateral wall of the developing nasal capsule .